Pain in the knee isn’t easy to deal with. You feel it throughout the day when you’re performing actions that you normally wouldn’t think about at all — things like sitting, rising from a chair, exiting your car or climbing a set of stairs. 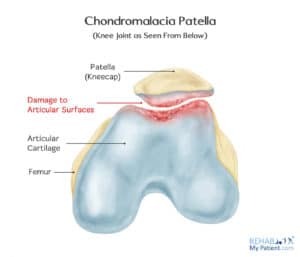 There are many possible causes of knee pain, and Chondromalacia is one of the most common. These bones are all covered with a layer of cartilage where they come in contact with one another at the joint. There are two types of cartilage in play here — articular and meniscus. (You’ve probably heard of people tearing their meniscus, since it’s a fairly common knee injury.) Cartilage is pretty tough stuff, but when injured, it can take awhile to heal. 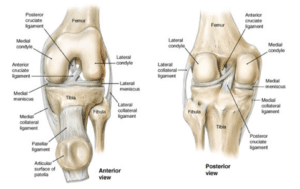 The articular cartilage can be worn away, and when this occurs, you end up with arthritis. The meniscus is your knee’s shock absorber, and when it’s damaged, you’ll definitely feel pain in your knee! Aside from bones and cartilage, there are also ligaments (tissue that holds the bones together), muscles, tendons and bursae. When any of these structures are injured or damaged, knee pain is an inevitable result. Maybe you’ve heard the term “runner’s knee”. It happens to be a slang term for Chondromalacia, and it refers to a condition that develops when the cartilage behind the patella (“kneecap”) softens and fails to do the job of cushioning the effect of bone-on-bone — in this case, the patella rubs against the femur and is experienced as pain in the knee joint, typically in the front or inside of the knee when sitting for a long period of time or when using the stairs or kneeling. You may also experience a grinding sensation at times. But it’s not just the cartilage that’s the culprit. If any damage occurs to the tendons and ligaments surrounding the knee joint, it can cause deterioration which in turn will affect how the joint works and even how the patella is positioned in relation to the other bones making up the knee, resulting in Chondromalacia. 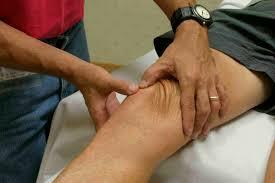 Your doctor will perform a physical examination of your knee and listen to a description of your symptoms. Even if she suspects that your problem is Chondromalacia, she’ll probably order an x-ray to rule out other possible causes of the pain. 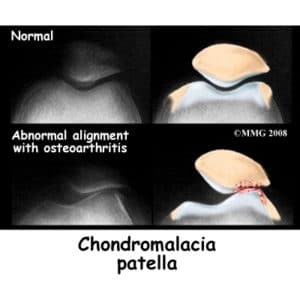 Once the cause is confirmed as Chondromalacia, the next course of action will likely be anti-inflammatory medications such as ibuprofen, along with icing and exercises to strengthen the muscles surrounding the joint and to restore alignment of the patella. That’s where the services of a trained physical therapist (PT) come into play. Most of the time, the combination of anti-inflammatory meds, ice therapy and physical therapy by a trained PT will do the trick. If they don’t, then corrective surgery may be the next step, although it is not typically necessary. If you’re living anywhere in Northeastern Pennsylvania and you’ve been diagnosed with Chondromalacia, go the phone and give the doctors of physical therapy at Cawley Physical Therapy and Rehabilitation a call at (570)208-2787. They’ll have you feeling like your old self again in no time!